Quite a departure, this year: none of the Society's main shows team was available on the Saturday, so rather than just contributing back up manpower, Shows North was called upon to do the stand on Saturday supporting Phil Sabin's Lost Battles game (Gabiene), and, on Sunday, David Edwards's Tewkesbury FoG display ... (so we became SoA Shows Central?). ...Colours at Newbury would be a good one to volunteer for: wonderful light and airy spaces, comparatively short queues for refreshments, free parking, a good selection of traders and a good mix of things to do when not on duty on the stand (including, on the Saturdays, a chance to join in a historical battle with the author of Lost Battles) ... This year actually we did two games each day - Phil supported Gabiene with a set up version of Empire (which the team played as their last game of the day) on Saturday ... 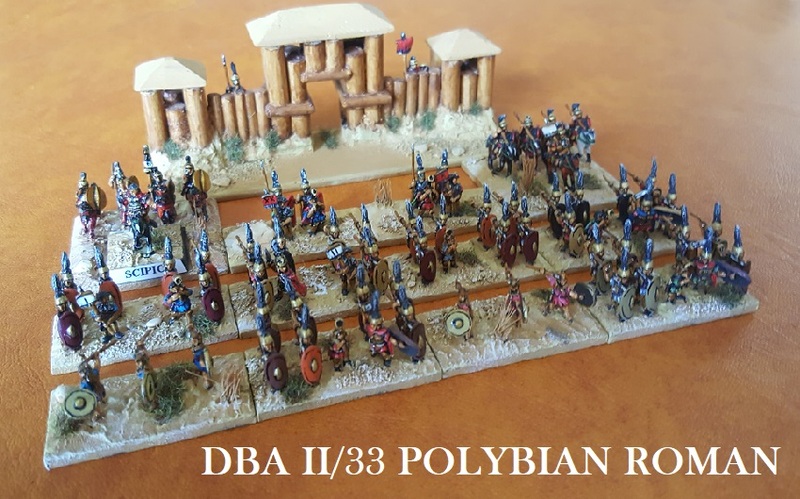 I ran my Double DBA Zama game to fill that space alongside Tewkesbury on Sunday. In addition to doing the stand and taking some pictures of the show, I played in the afternoon run of Gabiene, and ran three games of Zama on Sunday. Thanks to Graham, we were comfortably on time (so I can 'before and after' Phil's game). Gabiene, BC 316, was one of the key battle between Alexander's successors, fought in Persia between Antigonus and Eumenes. The battle was fought in a flat open plain, with, as Sabin reconstructs it, Eumenes's baggage close behind his army ... Antigonus has a value advantage of about 10%, mostly in a huge cavalry advantage only partially offset by Eumenes's superior quality phalanx - the Silver Shields. Although the battle becomes a race against time (can Eumenes find a decisive opportunity before his army inevitably succumbs to envelopment), the battle is governed by clouds of dust disrupting command and control (which Phil models by potentially allowing the flip-flop rule to be applied after a dice off between the commanders at the start of a new turn, effectively reversing the sequence and allowing the favoured army to go again*). For more on this, of course, have a look at Lost Battles. On Saturday afternoon, I was able to take the role - alongside 'liaison umpire' (?) Alan Waller - of Eumenes. We refused our right flank, pushed hard on the left, even redeploying some of the phalanx to exert pressure on Antigonus's right, battering his companions and forcing him to rally them repeatedly ... Committed to the front rank, Antigonus fell whilst rallying and was escorted from the field, giving us something of the edge we were looking for. Actually, their morale held up better than ours, so, eventually our surviving troops withdrew, leaving the severely mauled and leaderless Antigonids in command of the field. On points, indeed, we had managed a small victory. 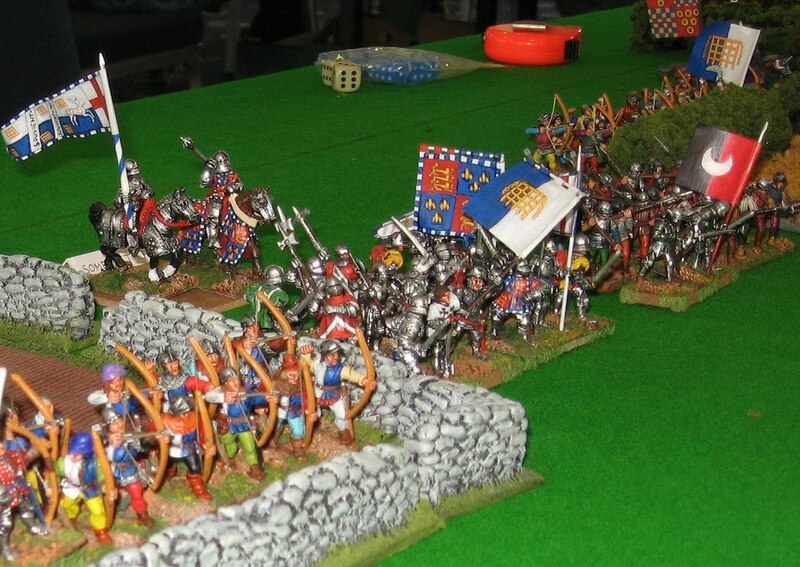 The main game on Sunday was a splendid 28mm participation game of Tewkesbury, giving visitors an opportunity to try out Field of Glory. David ran this through several times with players as varied as established game designers to ancients newbies. Meanwhile, I took over the sidebar space from Empire with my 10mm Zama. 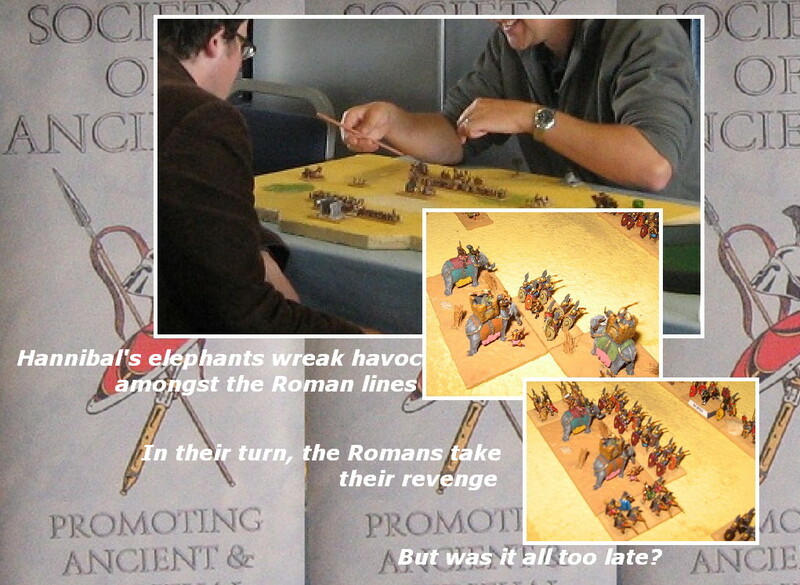 Although it was very much an extra game, I cannot resist reporting the game between two newcomers to DBA where Hannibal won ... by breaking through the centre with his elephants. Before they were eventually destroyed (vindicating the role of the Triarii), they left the Roman lines a little fragmented for when the reserve lines closed, and Hannibal was able to secure the final victory. For the scenario designer, of course, this was very satisfying (Scipio usually wins this battle, as it generally comes down to the infantry - and the Romans have the better troops for the infantry slog). Sunday started to go a little quiet by the afternoon - I'm told this may have something to do with public transport ... also it was a very nice day. However, this is a good show, and well worth the trip. That Sunday is quieter give visitors better access to everything - so mark Colours in your diaries for next year ... and for SoA members, why not get a free pass by volunteering to man the stand and help the Society? Thanks to the organisers, thanks to the volunteers, thanks to the visitors and members who dropped by. *i.e. the dust rule replaces IGO/UGO with an initiative roll where the winning player decides the order. As with a game like Armati, this means if the new turn is won by the player who has just moved second, he can choose to go first in the new turn - thereby gaining the same advantage as a Brilliant Commander like Hannibal can employ, with the flip-flop, in the standard game. The same limitations apply, so squares that just attacked cannot attack again (meaning the benefit is more in manoeuvre and exploitation) ... the advantage being somewhat tamer, these days, than in the original version of Strategos ..